I took this picture on a very special weekend. On this weekend I was out with my girlfriends out in the woods. We did a Goddess Retreat weekend where we got away from the kids and husbands and everything and just went into the woods. It was such a wonderful weekend and I am very much looking forward to going again next year. When we were walking on the trails I saw this and as I saw it the song ”Blessed Be The Horned God” began playing in my head. The song is by Kellianna and is a great pagan spiritual song. Very upbeat and happy. 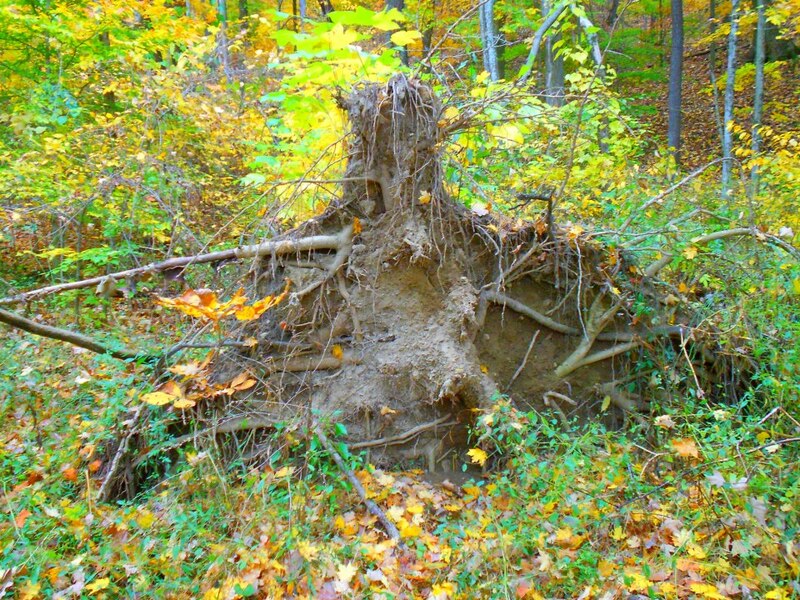 As I saw this uprooted tree’s roots I could see the Horned God with his stag horns and it made me smile. On this walk I also encountered a few Fairy Mounds and multiple dryads. It was a peaceful, beautiful and magickal day…and weekend for that matter. Cosmopolitan what the HELL are you thinking?!?!?! A new hobby for spring? Could it be I am finally growing a green thumb?? I have taken the leap. I have been jump started, by the fabulous giving away of trees by my employer, into undertaking a new thing. I, your favorite (maybe!) opinionated activisty midwestern girl, am FINALLY learning how to grow things. I have purchased one of those seed starter sets that is like a little greenhouse, some seed starting soil (organic even!) and multiple packs of various types of seeds. I have flowers and herbs and a few fruits and vegetables. Here is hoping….right? I also have several tree starts that I am hopeful will last until I can get them planted. I currently have them in some clay pots with potting soil surrounding them and plenty of water (but not too much) so that they will be good until I can get them into the earth or a big pot. I don’t know yet. Maybe we will just pot them in large plant pots and do that til they are big enough to really thrive in the ground. I don’t know yet. I have grand thoughts. I have a grand design for the ultimate garden…I hope that it works out the way I want. Here is hoping my dogwoods, flowering plums and pines don’t die. Here is hoping that my moonflowers, forget me nots, alyssums, morning glories, cosmos and whatever that other flower is along with my herbs (lots of them) germinate and sprout up and develop into beautiful functional and flowering plants. I hope that it works. I REALLY REALLY REALLY hope it works. Wish me luck! Ok so I know you all read about Bath & Body Works and why I love them so very much. Well I have fallen in love with them all over again. Visualize this: you have taken a medication that made you break out in hives around about the same time that you started using a new shower gel and fragrance line from your favorite chain smell good store. The medication (which I will post about later! Stupid NP put me on ANOTHER thing that I am allergic to! I swear she is trying to kill me) ended up being one that you are allergic to which you never should have been on but you trusted the NP who prescribed it. So you break out in hives all over your face and chest and are just dumbfounded as to how. A visit to the pharmacy has you stop everything you are taking and switch to plain white dove just to slowly reintroduce everything and find out what the heck is going on. Well I did this and found out that the diuretic I was put on was ALSO a sulphur drug (close chemical cousin to sulfa drugs). So after the break out clears up you go back to most everything you were doing. Except you have so many different scents from your favorite chain smelly good store that you don’t use that new line you had purchased for a while. About an hour later at work….there is one small bump. Eh…maybe just a break out. Not hives, just a pimple…no big deal. The next morning you lather up with the same luscious goodness and end up with a smattering, not just a few, a whole smattering of hives. This is where I fall in love with Bath & Body Works again. I emailed them and they called me. They called me concerned for my well being and health. They immediately agreed to replace the whole line, because I had the WHOLE line. They sent a mailer to have it picked up and overnighted to them. They wanted to put the batch through testing and look for anomalies and see if this was something that just I was allergic to or if it was a bad batch. While I was in the process of sending things back they called their medical line and had them give me a call to take an incident report and make sure that I was ok. Yup you read that right. They called their medical line, told them what was happening and then had them call to check on me!! Once received, they sent me my replacements which arrived in a very nice box and in a Bath & Body Works bag inside of the box! I don’t know about you but I have a stock pile of things stored i Bath & Body Works bags. I love them. So handy. So in short….I LOVE LOVE LOVE LOVE LOVE LOVE LOVE LOVE LOVE Bath & Body Works! I got an email today from hystersisters.com telling me Happy Hysterversary. To be honest, I had not even thought about it that today was the 1 year mark of when I had my surgery. It has been a really long year and there have been ups and downs and everything finally seems to be leveling out. When I do take the time to think about it, it makes me think about what I lost that day. Really I gained my life back. Why do I keep thinking that I lost. I would rather just not think about it…. Oh Bath & Bodyworks….How I do love you so…. For a very long time I have been a faithful and loyal (if sometimes absent) customer of Bath & Bodyworks. Ever since I was in high school I have loved wandering into their fragrant space and reveling in the joy of the new fragrances. I would go in and buy some things (usually during the semi annual sale) and take them home and love love love them for about half a bottle…then ennui would set in and sadly I would lose my interest in the scent. Now it is true, there have been some that have had lasting power. Freesia was one of my favorites. Twilight Woods, Secret Wonderland, Dark Kiss and Warm Vanilla Sugar are also high ranking with me. Country Apple was my all time favorite but alas, they discontinued it. Over the years I have amassed a large collection of scents that I thought would be wonderful, but ended up just being kind of -eh- for me. I have a cabinet filled with them that my wonderful husband has been graciously trying to use up to avoid waste. Well….that is all over now. I gathered up that cabinet worth of unwanted body washes and sprays, lotions and bubble baths and I packed them into a Bath & Bodyworks bag and took them back. You read it right, I took them back. On a recent trip into the store to exchange some items my well meaning and loving husband had gotten for me for our anniversary, I found out about their return policy. A very liberal policy that I had never even thought to look up. I was informed that, no matter how much you have used it or how old it is….if you do not love it 100%, you can take it back! So I put this to the test. I took in bottles that I have been collecting for at least five years. I told them that I understand if there were some that they could not exchange. I ended up VERY surprised and VERY happy. I traded in all those unwanted bottles for a bottle of perfume for me, a bottle of cologne with matching body wash, deodorant spray and lotion for my hubby, a body butter for me, a free wall flower and scent pod AND 2 three wick candles. I had over $100 worth of returns and in such I got over $100 worth of product! Now, it is recommended that you be honest. If you have two squirts of spray left, please do not take advantage of the return policy to restock. But even if you only have two squirts of spray left, they will exchange it. I have a new favorite store….even if it was an old favorite store. I have a new reason to love Bath & Bodyworks. An underserved population bucking the system…. Last night I went on a search of the internet. I looked high and low for a shirt that I have been wanting to get. It is a shirt from the band Pearl Jam. As many of you might know, Pearl Jam recently celebrated their 20th anniversary. I have seen a resurgence of the Pearl Jam “Choices” t-shirt and wanted it badly. I used to own this shirt in high school. I wore it all the time. I miss it terribly and would love to have it. I went online to Rock World East. They are a rock memorabilia store that I have had good luck with in the past. Their service is awesome and their prices are pretty great too. I was unable to find the shirt any bigger than XL. Now, I don’t know if you know this or not, but dear reader, I am a woman of substance. I am not a twig. I have a lot of curves and I need a bigger shirt to cover them. I wanted this shirt in a 3x. Sadly I had trouble finding it. So…I emailed the company. We are sorry for the inconvenience. We are always looking to get a wider selection of sizing but we are forced to buy what is available. I understand that there are limitations that retailers have to deal with. After I had sent the email to them, I found the TenClub. On that site I found the “Choices” shirt in the size I need. I also found the “Alive” stickman hoodie in my size! I was ecstatic! So I emailed Rock World East back. I really do hope that there comes a day when us people of substance can go to Hot Topic, Rock World East and other trendy cool stores and find clothes that we can wear. Just because we are big does not mean that we don’t want to dress cool too. We are restricted by the licensing contract for Canada. We are a Canadian company. We agree with you in regard to sizing and we are trying to correct this oversight. Thanks for your note and feedback. I really hope that they can correct this oversight…. Have you been cheated by Casual Male XL or Destination XL? This past weekend there was a coupon that was issued for $75 off of a purchase of $100 or more. The coupon was good through 11-6-11. When we logged in on 11-6-11 the coupon would not go through. One of the orders that my husband had placed has been cancelled and the money refunded. No email, no call, no notification of any kind. I contacted their service rep via chat yesterday. The conversation is listed below. I did inform the agent that I would be putting this on my blog. I am Jeni. Casual Male’s agent is Diana. If you feel you have been cheated by this horrible company also, please share your story. Diana: Hello, my name is Diana. How may I assist you? Jeni: I was made aware of the coupon you guys had this weekend that was to expire on the 6th. I went onto the site yesterday to make a purchase for my husband for our upcoming anniversary. Unfortunately it was saying that the coupon was not valid. This is highly disappointing because the expiration date was 11-6-11 not 11-5-11. Jeni: I can understand that there were many people who were taking advantage of the coupon because it really was a great deal…however to pull the coupon early is false advertising. It is not right that your company did this. I was not able to get on the computer without him around until yesterday when it still should have been active. Diana: Thank you for contacting us. I apologize for the inconvenience. One moment please. Diana: Please provide the email address, you received the promotional offer. Jeni: I did not receive it via email. A friend had the coupon and gave it to me. I am not sure what email address they would have gotten it from. Diana: Unfortunately, we can not honor the coupon. If you’d like to place an order I can honor 20% off. This is the best that we can do at this time. Jeni: Well i will be contacting the Better Business Bureau about this. It is horrible that your company chose not to honor a VALID coupon. Diana: I apologize for the disappointment. Our system flagged only the customers that received an email of this promotional offer. Unfortunately it is no longer valid at this time. I’m sorry. Jeni: Well i will be contacting a lawyer. This is false advertising. Diana: I apologize for the inconvenience. Diana: Our corporate number is 781-828-9300. Our CEO is David Levin. Diana: Thank you for your patience. His name is Dennis Hernreich. Jeni: Thank you. You know it really is a shame that there are so few places to find quality clothes for plus sized people. We are damn near forced to shop at your store for my husband, but then we are treated like this. Diana: I’m sorry for the disappointment and inconvenience this matter has caused. Unfortunately we can not honor the discount. Jeni: That is fine. I am copying this conversation to my very well publicized blog and will let as many people as I know and can get to in the blogosphere and online world know about your false advertising. Oh how these mom and pop shops like to tease…. I do not know what it is. It seems like every locally owned business that I visit has done this at one time or another. Whether it be a nail salon, a used cd shop, a pawn shop, a pizza place, a yarn store… They all seem to be guilty of misleading me at one time or another. The horrible offense that I am speaking of is leaving the “Open” sign on well after they have closed for the night. Some businesses DO stay open later than the hours which are posted on their signs…so I admit I have fallen prey to this. I wonder sometimes if they have a hidden camera and are watching to see just how many do fall for this cruel joke. I wonder if they are going to jump out and say “Smile! You’re on Candid Camera” or something equally asinine. Those poor shoppers pull into these businesses with their lights on and stop their cars, take off their seat belts, haul their weary bones out of their car after a long hard day of work and walk hopefully up to the door. Upon reaching the door their hopes are dashed upon the rocks of despair. The business is in fact closed. Curse you, small business owner that refuses to turn off your “Open” sign. Curse you and your cruel mischievous ways.